Get the best rate and the best flexible cancellation policy by booking directly with us. Get also a 5 dollars daily coupon on the parking rate (10 dollars instead of 15). The BBV, nestled in the heart of Montréal’s vibrant gay village, offers its clientele a warm welcome in a charming central location that is only steps away from many of Montréal’s most interesting neighbourhoods. Our guesthouse is equipped with a variety of comfortably furnished rooms – each equipped with an individual air-conditioner, a friendly communal breakfast area, two spacious outdoor patios and secure indoor parking. Our aim is to offer the perfect compromise between a stay in a hotel and guest accommodation in a private residence. We want you to feel at home while staying with us, and not feel as though you are guests. We run our establishment with utmost professionalism while striving to maintain a relaxed environment. With heart and soul, we do everything we can to ensure that our guests’ stay in Montreal is unforgettable and, whenever possible, we strive to meet their every need. Our establishment is in constant evolution with several improvement projects currently underway. Come visit us and share in our charming piece of Montréal! The BBV, a friendly and hospitable Bed & Breakfast situated in the heart of the Village offering you all the comforts of home away from home. Phillipe and Nicholas were great hosts! The location is convenient, near the metro and many sights. The room was really comfortable and quiet with a deck to the side for a glass of wine each evening. The breakfast was out-of-this-world great. We looked forward to breakfast every morning with homemade jams, granola, yogurt, fresh fruit, egg sandwiches, croissants and so much more. Every effort was made to enhance our experience throughout our stay. We feel quite lucky to have had four fabulous nights at BBV and would recommend it to anyone visiting Montreal. This BnB is worth looking at when visiting Montreal. It is well located, fairly priced, easy to get go by car and offers clean well appointed rooms of varying sizes. Breakfast offerings are varied and fresh made. The hosts, Phillipe and Nickolas were great. Friendly, accommodating and hard working they add a warm touch to your stay in their city. Located blocks from metro stations makes navigating this city easy. Great restaurants are also within an easy walk. We stayed in their studio with a frig, microwave, small couch, plenty of closet and drawer space and a small but very functional private bath...and again clean. 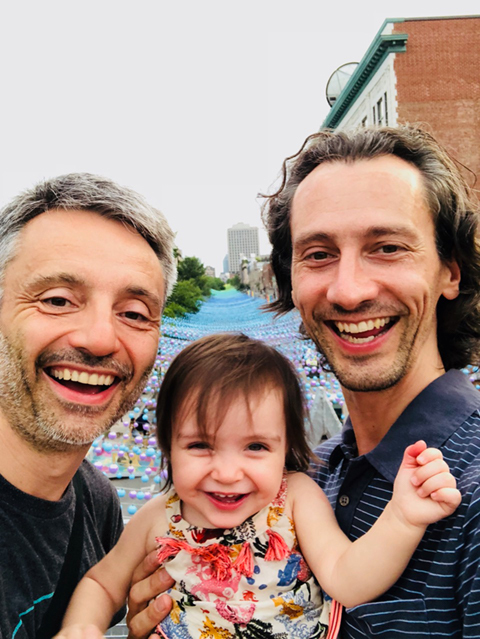 We offer our highest rating which is that we will return to see Phillipe and Nickolas and their beautiful daughter on our next visit to Montreal. Do not second guess this, book today and enjoy your stay. Stayed there with several friends for my fiancé’s 50th Birthday. It was four days of complete fun. The rooms were amazing, the brunches were delicious, and the owners were so nice. Everything was personalized to what we needed/wanted. I have stayed here a few times and will continue to stay here everytime I need a place to stay in the village. I felt like I had found a little treasure when I checked in to this lovely property located in a very popular part of town. The beds were comfortable, the rooms were well decorated and I appreciated that even though there was a shared bathroom, the bedroom had a beautiful sink area. Breakfast was really delicious and home made and the rate for all of this hospitality was a fraction of what it would have been elsewhere. I would highly recommend this B&B and would look forward to returning there on my next visit to Montreal. These rooms have a queen-size bed and a private bathroom with shower. Flat screen cable TV, individual air-conditioner and high-speed wireless Internet access. Breakfast and daily room refreshment included. Secure indoor parking is available for 15$ (+taxes) per night. Located on the second floor across from the shared bathroom, this room has a queen-size bed. The room is equipped with a sink that can be used to freshen up. This room is ideal if you are staying with friends. Very spacious, it has 2 double beds and is located on the second floor, near the shared bathroom. The room is equipped with a sink that can be used to freshen up. It accommodates up to 3 people. Our quaint two-story cottage was entirely renovated in 2011. There is a fully equipped corner kitchen and a living room with a double sofa bed on the first floor and a bedroom with a queen-size bed and a bathroom with shower on the second floor. Complete bedding, individual air-conditioner on each floor, flat screen cable TV in the living, washer and dryer and high-speed wireless Internet access. Private entrance. The cottage accommodates up to 3 people. Breakfast is optional. No room service. Breakfast, provided with room rentals, is served from 7.30 am to 9.30 am on weekdays and from 8.30 am to 10.30 am on weekends. Schedule subject to change depending on the season. Menu: Freshly baked croissants, fresh cut fruit, fried eggs, jam, bread pudding, yogurt, granola, sliced bread, muffins, bagels, bacon, local cheese, variety of cereals, juice, fair tarde coffee, tea, hot chocolate and our specialty, “The Villager” (grilled muffin, cheese, egg). Our jam, bread pudding, granola and yogurt are home made. A gluten free breakfast is available upon preliminary request. Certain periods of the year, such as Montreal Grand Prix, Jazz Festival or Gay Pride are subject to certain conditions (additional charge and/or minimum stay required). BBV reserves the right to apply a one-night room charge (+ taxes) if the cancellation is made 2 days or less prior to your scheduled arrival or two nights in case of no-show (cancellation without any notice). Please note that every change or cancellation to an existing reservation has to be done through email. Special conditions apply to stays longer than seven nights and to reservations of three rooms or more. Secure indoor parking is available for 15$ (+ taxes) per night. Q: Where in Montreal are you located? A: We are located in southeast Montreal, in the heart of the Gay Village. The Quartier des spectacles (downtown entertainment district) is a mere 20-minute walk from the BBV (3 metro stops) and Old Montreal is 25-minutes by foot (3 metro stops). A Google map is available on our site’s “Contact” page under the link “Guide me”. Q: Are you close to a metro station? A: We are a 2-minute walk from the Beaudry station (green line) and a 10-minute walk from the Berri-UQAM station (green, orange and yellow lines). Update: Beaudry metro station is closed until June 2019. Q: From the Airport: Bus or taxi? A: A public bus (#747) departs approximately every 10 minutes from the airport for downtown. Tickets can be bought inside the airport (either at the automated machine or at the currency exchange counter on the left side before exiting the airport at the door marked 747) for 10 dollars per person, tax included. The trip into town takes approximately 45 minutes if traffic is not heavy. The final stop is Berri-UQAM, which is a 10-minute walk from the BBV. You can also take the metro from Berri-UQAM to Beaudry (1 stop), on the green line, in the direction Honoré-Beaugrand. A taxi from the airport is a fixed rate of 41$, tax included, tip not included. It will take 30 to 40 minutes if there is no traffic. Q : How do you get to the BBV from the Gare Centrale (Central Station) or the Gare d’Autocars de Montréal (Central Bus Station)? A: The Gare Centrale (Central Station) is located on the Orange line of the Metro at Bonaventure station. To get to the BBV, take the Metro, direction Montmorency, to Berri-UQÀM station (4 stops) and then transfer to the Green line, direction Honoré-Beaugrand, and stay on for one stop. Get off at Beaudry station. This station has only one exit, which is a five-minute walk to the BBV. The Gare d’Autocars (Central Bus Station) is connected to Berri-UQÀM Metro station. From Berri-UQÀM station, take the Green line, direction Honoré-Beaugrand, for one stop and get off at Beaudry station. This station has only one exit, which is a five-minute walk to the BBV. If it’s nice out, you can walk from the Central Bus Station to the BBV in 15 minutes. Q: Why do we ask for your flight number when you make a reservation? A: As we make it a priority to welcome you the very best that we can, we follow your flight status so that we are aware of any delays in your arrival. Q: Why do we ask for a credit card number when you make a reservation? A: We ask for your Visa or Mastercard number with its expiration date to simply confirm your reservation. A: Normally, check-in is after 3 pm and check-out is before 11 am. Operating around a small family unit, we do our best to accommodate special situations and provide our guests with the most flexibility we can, however, it is impossible for us to be present at our reception desk all day. If you change the arrival time that you provided when making your reservation, your arrival flight, your driving itinerary or if you are stuck in traffic or at the border crossing, we ask you to please inform us of this delay as soon as possible so that we can make arrangements for someone to welcome you at your arrival. It is also possible to leave your suitcases and take your room keys in the morning during breakfast hours. A: Our simple but hearty continental breakfast is served from 7.30 am to 9.30 am during the week and from 8.30 am to 10.30 am on weekends and holidays. This schedule is subject to change depending on the season. Our kitchen is equipped with a large rustic table that seats up to 12 people comfortably. Q: Are the photos of the rooms accurate representations? A: The photos were taken by a professional photographer. Although the rooms are made to look their best, they were photographed as they are in reality. No special effects, retouching or wide angles were used. Q: How big are your rooms? A: The rooms are medium sized, similar to the size of a room in an average Montreal house, approximately 10 m2 / 105 feet2 , not including the washroom. If you are looking for a bigger room, we invite you to book the cottage, offered with or without breakfast. Q: Room with private or shared bathroom? R: A: The BBV has one shared bathroom on each level. Rooms without private washroom are all equipped with their own sink. Cleanliness is our priority, as can be noted by comments left by guests on Tripadvisor.com. Also, sharing a bathroom is economical and a way to save money on the room rate during your stay at the BBV, while benefitting from the same service. Q: Am I guaranteed to stay in the exact room that I reserved? A: The BBV guarantees the type of room (a room with private bathroom for example) agreed upon booking. It is not technically possible to book rooms 10, 11 or 20 in particular. However, we will consider your preference if you mention it during the booking process, whenever possible. A: The price, in Canadian dollars, includes one night stay, either single or double occupancy, breakfast and a daily room refreshment (towel, bed, washroom). Taxes are not included in the room rate (approximately 19%). Parking is available at 15$ per day, if required. A: As we are a small establishment with 5 rooms, therefore, any last minute cancellation is very costly for us. BBV reserves the right to apply a one-night room charge (+ taxes) if the cancellation is made 2 days or less prior to your scheduled arrival or two nights in case of no-show (cancellation without any notice). A: We do not allow animals. Please note, however, that we have a shorthaired French Spaniel that is not permitted in either the guest rooms or the dining room during breakfast service. Q: Are you a gay establishment? A: Although we are located in the heart of the Gay Village, we are happy to welcome everyone, regardless of orientation. This is shown by the diverse profiles of previous guests that have posted comments on the travel website Tripadvisor.com after staying with us. Q: Are you an officially recognized Bed and Breakfast? A: Yes. We are recognized by the CITQ (Quebec Tourism Industry Corporation), the government sponsored organisation responsible for certification and classification of tourist accommodation. We have been awarded 3 suns. We also are member of BBCanada. Q: Are you an environmentally responsible business ? A: The environment is our priority. Also, we use eco-friendly cleaning products, fair trade coffee, maple syrup produced by a family organic maple grove and bacon made without the addition of antibiotics from pigs raised with respect. BYOB restaurant in the heart of the Village. Local cuisine, seasonal menu & relaxed ambiance. Le Red Tiger is a Vietnamese pub that aims to bring alive the unique tastes, aromas, and ambiance of Vietnam. Our menu consists of tapas to share inspired by street food typically found in our motherland. Refreshing house cocktails are served with utmost care by our impassioned bartenders. The atmosphere is festive and casual; come experience it for yourself! All-night diner for Québécois grub & local microbrews, with many poutine options & hefty breakfasts. whole foods, plant-based, good for you and our planet. Kamehameha Snack-Bar is Montreal’s first ever Hawaiian snack bar. Kamehameha offers flavorful, light and fast meals inspired by Oahu’s North Shore surfing culture. Come in, kickback, and relax in our island decor, as you savour on everything from poké to acai bowls, smoothies, Hawaiian-inspired snacks and ice cream, and so much more! Only a stone’s throw from the metro, you can come for a drink, or you can even stop in for a bite to eat. With a generous array of simple dishes, tasty snacks, and what some would call comfort-food, the menu is sure to satisfy both the hungry, and those with a finer palate. Please note that all reservations will be done through our website. For any modification of existing reservation or for stays longer than one week, please contact us by email only. We are available for any information request by phone from 9.00 am till 7.00 pm ET.